These Fairy-Tale Castle arm and leg warmers are a perfect gift for boys or girls. A high quality fun and functional accessory for babies, toddlers, kids and tweens. Great party favor! Our warmers are super soft, comfortable and a thicker quality than most patterned warmers available. The stretchy knit of these fun design warmers will not lose their shape, cut into legs or fade in the wash.
You will LOVE these Leg Warmers! - This listing is for one pair of KOOL KID LEG-ARM WARMERS as shown in the first photo. - AS LEG WARMERS they are great as a fashion statement or extra coverage for warmth under pants, skirts or during diaper changes. Also functional as protection for little legs from rough surfaces and the sun. 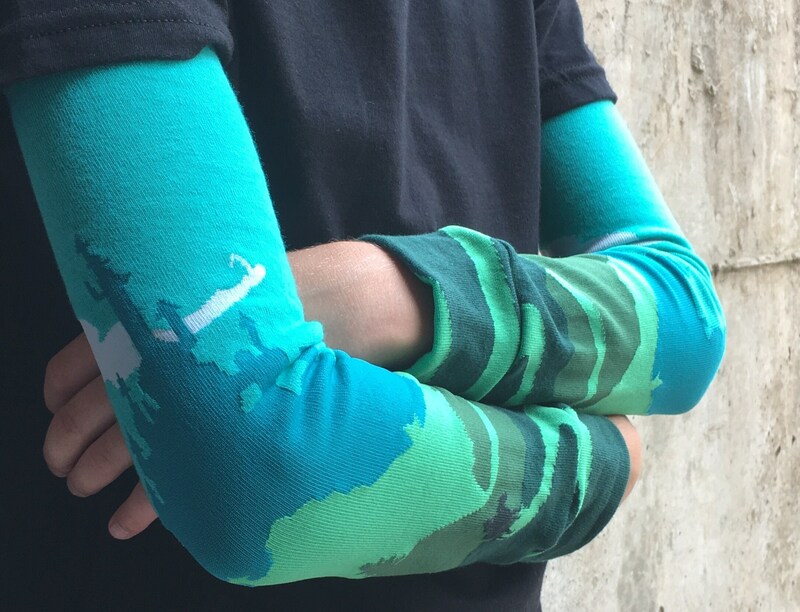 - AS ARM WARMERS you can quick-change a short sleeve into a long sleeve and let your kids rock their own style! - ECers.....you can't find a better pair of "pants" around! Fabulous for potty training! Just undies and Kool Kid Leg Warmers and there will be no more messing with extra clothing when you have to get your little one on the potty NOW! - Gift wrapping and gift note available at checkout. You will receive one pair of Arm/Leg Warmers in your preferred length as shown in the listing photo. Each pair is made with care and all seams are professionally finished. Product fit and quality satisfaction guaranteed! Mama Runs with Scissors ships internationally and combines shipping for multiple items. Please see our store policies by clicking the Shipping&Policies tab. Your gift will be wrapped in a bright, solid color tissue paper with a coordinating ribbon. The example shown in photo was for a Christmas gift. So cute! Just perfect as always, thank you! My daughter loves these leg warmers and has received many compliments! Very cute. Well made. Shop owner easy to work with. I want all my customers to be SUPER SATISFIED!!! I try hard to make sure all items in my shop are very well made with high quality materials. If there ever is a problem, I am happy to work out the best solution for the situation. This would include refunds or replacements. I am currently shipping out orders in 1-3 business days of receiving payment. If it will be longer than three business days I will send you a message with the estimated ship date. I ship to the address that you provide on ETSY. USA orders are sent via USPS first class mail with delivery confirmation. This is a 2-5 business day service. You may also choose the priority shipping option. This is a 1-3 business day service. International orders are sent via USPS first class international. This can be a 1-3 week service. Contact me if you would like to pay extra to upgrade to a faster shipping option. Tissue paper wrapping and gift tags with your own message available upon request. on most items in my shop. Convo me for details!